The authorized history of R. John Wright Dolls, this new book is the definitive full-color reference to the works produced by the company. Rooted in the tradition of early toy makers such as Steiff, Lenci and Käthe Kruse, R. John Wright Dolls’ playful and exquisitely crafted figures are recognized throughout the world for their unprecedented level of workmanship and technical sophistication. Krystyna Poray Goddu, noted doll expert and founding editor of DOLLS, has written a dual biography of John and Susan Wright, as well as a collection of critical essays that discuss the development and importance of significant creations, and place them in the context of toy history. During the early 1980s, the Wrights made another major development in their work: They turned their focus from adult characters to children. In 1980 John began to sculpt the first child’s head. His vision had been forming for years, from the first sight of the Steiff schoolchildren in The Doll. Inspired not only by Steiff, but by the sturdy, playful forms of Lenci, Kruse and the wooden Shoenhut dolls of the early twentieth century, and captivated by his own young Lillian, he endeavored to meld these influences into his own distinct creation. As he worked in this new direction, the young company’s work continued to expand. In the fall of 1981, just before the birth of their second child, Arthur, the Wrights bought their first home, in Cambridge, New York, just over the Vermont border and on Susan’s regular path to The Toy Works. The house became home to the Wrights and to R. John Wright Dolls. Workers arrived daily to do handwork on the dolls–sewing on wigs or closing up holes, or to take fabric away and sew the clothes at their own homes. The birth of Arthur, in January 1982, came immediately after the introduction of the first eight molded-felt children. This change in subject matter created an explosive level of interest in their work. 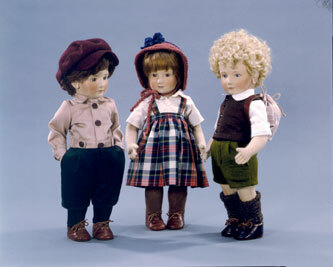 “We showed the prototypes of the children dolls at a UFDC Regional Convention in Bedford, New Hampshire, in 1981. And we were mobbed!” Susan relates. Responding to the evocation of early dollmakers implicit in the Wrights’ children, antique collectors found themselves competing for purchase of these contemporary pieces. Massachusetts collector Roberta Roberts, who had already bought some Character Dolls from The Enchanted Dollhouse, was among them. “I collected the French and German characters as well as Käthe Kruse and Lenci, but when I saw John and Susan’s children, I had to have them all! There is just something about cloth dolls–they are softer, more hand-molded, than the porcelain ones.” Luckily for Roberts, there were antiques in her collection that the Wrights coveted, and over the years that followed many happy exchanges were made. A firm friendship was forged as well; Roberts and her husband eventually became honorary grandparents to the Wright children. “We formed a bond right away,” she reminisces. Today her collection of R. John Wright Dolls numbers close to one hundred pieces, and continues to grow. 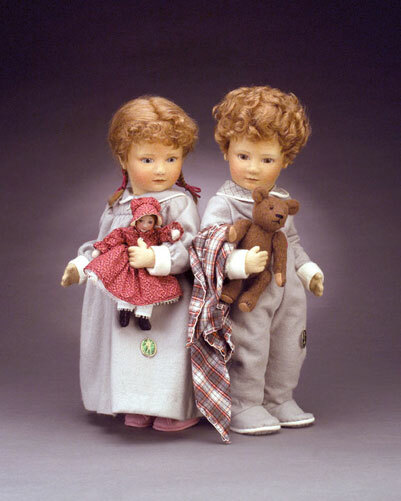 John and Susan continued briefly to produce the Character Dolls, as well, but the overwhelming response to the children made it clear that their entire focus and production needed to shift to children. Specialty doll shops were springing up in response to an increased interest in dolls of higher quality and dolls made by artists. Toy shops were beginning to establish special doll departments. The owners were learning of R. John Wright Dolls from UFDC and NIADA members and orders were coming in. These far-sighted people included Danny Shapiro of The Toy Shoppe in Richmond, Virginia, Bea Skydell of Bea Skydell’s Dolls & Toys in Middlesex, New Jersey, Lily Bergh of Little Switzerland in Huntington, New York, and Isobel Weill of Best of Everything in Brooklyn, New York. Shapiro remembers first seeing the Character dolls in an Enchanted Dollhouse catalog in 1979, and being “taken with the absolute charm of the work, combined with the very fine craftsmanship.” He called them and im­mediately became a customer. Jean Schramm at The Enchanted Dollhouse, always a pioneer, now commissioned John and Susan to create a child doll exclusively for her shop. They created Captain Corey, a red-headed boy in a sailor outfit, holding a toy boat, in an edition of only fifty pieces. Captain Corey was the first in what would become a tradition for the Wrights–the shop exclusive–and very quickly, for many other dollmakers as well. The Toy Shoppe’s Danny Shapiro, who had grown up in the toy business, was next to commission an exclusive. With his discerning eye and deep appreciation for fine old toys, he was one of the earliest retailers to begin seeking out and highlighting the work of artists. 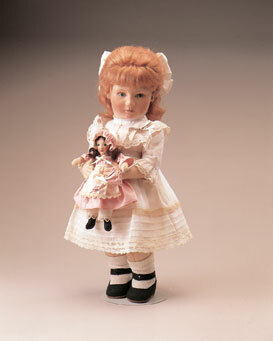 “Since we opened our shop in 1975, we were looking for dolls that went beyond the standards,” he says. His idea for the Wrights came from one of his favorite books: The Little Prince by Antoine Saint-Exupéry. “The Little Prince has always been a significant book for me,” he explains. “Everything in it is told from a child’s single-focus view of the world, and yet it is terribly adult because it is about mortality. I thought the book and the Wrights’ work would be a perfect match. In their dolls, John and Susan marry that same simple childlike clarity with a complexity of craftsmanship that only a sophisticated artist can achieve.” He realized that nobody had ever created a doll of the beloved title character. John and Susan, each formed by a lifelong love of books–and now, with their own small children, holding an enhanced experience of children’s books–responded enthusiastically to this challenge. “I knew this would be a very important doll to many people,” John explains, “since Saint-Exupéry’s fable is dearly loved for its message of gentle optimism and goodwill.” He and Susan felt they would be breaking new ground in interpreting this character. “The challenge was in keeping the doll simple enough that the interpretation would not intrude on the various perceptions held by readers of the book who, like myself, had only the sketchy and whimsical illustrations to refer to.” In 1983 they produced an edition of 250 pieces of The Little Prince exclusively for The Toy Shoppe. Today, The Little Prince, along with Captain Corey, are the most avidly sought-after dolls created by R. John Wright Dolls. Thoroughly absorbed by their growing doll business, John and Susan realized they still had a piece of unfinished personal business to tend to. In 1983 they took a moment out of their busy professional life to hold a formal marriage ceremony at a nearby Episcopal church. Three-year-old Lillian was flower girl and one-year-old Arthur was ring bearer. A gala reception at their home followed, complete with family friends and a local quartet playing traditional Scottish and English aires and reels. Having conquered the crafts world, UFDC and NIADA, and now in demand by the growing number of doll retailers, the Wrights knew they had to cement their position as an established doll company at the ultimate showplace: the American International Toy Fair in New York City. Since 1903, the annual Toy Fair had been the major event of the toy industry, the place where all the important toy companies gathered to display new introductions and take orders from the toy retailers, for whom it was the buying event of the year. In 1983, R. John Wright Dolls took their first booth at Toy Fair, establishing themselves as major players in the doll world. It was their second Toy Fair appearance in 1984, however, that set off the next explosion of interest in their work. This time the explosion was caused by a new series that would take their reputation to another level. In 1984, the Wrights displayed their first prototype of A. A. Milne’s classic characters, Christ­opher Robin & Winnie the Pooh. To order the book, priced at $45 or $125 (for a deluxe signed and numbered limited edition of 500), contact Reverie Publishing at 888-721-4999.